And why not? After being the most talked about book this year and living up to that expectation, we now have a Site for this book. 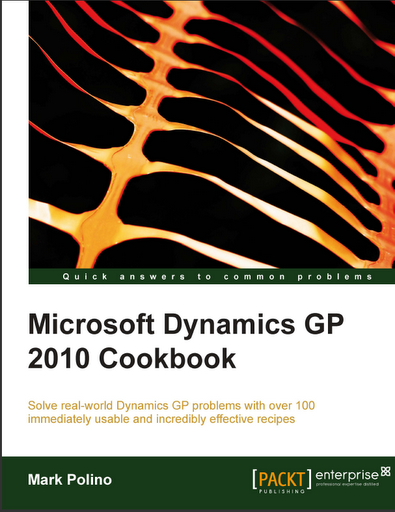 Visit the Site: Microsoft Dynamics GP 2010 Cookbook Site. There is a Preview Chapter available for this book, if you go to Packt Publishers site. I would like to highlight one more Recipe http://rcm.amazon.com/e/cm?t=widgetsamazon-20&o=1&p=8&l=bpl&asins=1849680426&fc1=000000&IS2=1&lt1=_blank&m=amazon&lc1=0000FF&bc1=000000&bg1=FFFFFF&f=ifrwhich is quite simple yet very interesting and informative. In that chapter, Organizing Dynamics GP, Mark explains us about User-Defined Fields, well a bit more than what we would have thought about. Mostly users think about User-defined fields only as additional information and sometimes take it as additional fields for integration from some source. Read this recipe and your perception would be expanded about these simple wonders. 1. Simplifying users’ searching for this book. 2. Urging my blog readers to give it a certain shot. 3. Just expressing what I thought about this book. My Perception: If Packt could give us an entire chapter full of such nice tips as preview, we must understand what the rest of chapters and the recipes would give us. And trust my words, you won’t feel let down. I honestly don’t mind being RUDE in this regard. Disgusting to hear that Mark’s Cookbook (eBook version) was distributed free online by someone. That’s the least word that I could use. Disgusting. Writing a book is not an easy thing in life. It must first engage the reader. It must give the user the worthiness of his/her time spent on reading it. It must be always fresh whenever you open it and read it. Mark’s book does just that. He has put his efforts & experience in giving us an awesome book full of information. So those who are doing this disgusting act, STOP ACTING SMART and BUY the book. Sacrificing one movie night’s expense for this book, is not a bad idea, for god’s sake. Let’s be professional, at least to the extent of not hurting one’s efforts and emotions. Alright, we have seen and read so many books. On top of that, we have umpteen blogs for GP, newsgroups, forums and what not…!!! In fact Microsoft Dynamics GP itself gives us tons of manuals; PDFs and Context Sensitive CHMs. Mark Polino has written a book titled Microsoft Dynamics GP 2010 Cookbook. What’s different in this book from the ones that we have already? 1. This book tells us HOW TO USE GP and not what’s there in GP. It’s a practical guide and not just theory. It tells us the tip and also why that tip. 2. This book carries the immense experience that Mark has got over this long period of his career. And trust me, that experience is tremendous. A guy who has crossed 2000 posts in his GP blog, who enlightened this GP Community with his 50 Tips in 50 Minutes and made it THE TOPIC of this year’s Convergence, Mark has consolidated all of his experience to give us a collection of tips to USE GP in an efficient way. Will I get benefited from this book? Will this book offer what I want? Will this book prove that it’s worth of what I pay for it? Now please quit asking such questions and read this sample chapter: Organizing Dynamics GP. The publisher of this book, Packt Publishing, has given us the above chapter as an extract from the book. Trust me, the other chapters are just better than each other. For instance, Mark explains the option “Allow Sale of Discontinued Items”, which I bet most of us (at least me) would have struggled to find. Those who are that “Adventurous” type would have known that, but certainly not all. There are 290 pages of crucial tips which will enhance any GP Consultant / Administrator. And sure, I can go on and on about this book. This book certainly live up to anyone’s expectation of getting enriched with GP Tips. I sincerely recommend to go for this book and keep it in your library. Any point of time, you can come back to this book and it will tell you what’s needed real-time. Thanks so much, Mark, for giving us this book full of awesome tips. And I am sure we can expect more from you in future as well.